If you like Taiwanese Night Market food you are in for a treat with Chicken and mushroom Korokke 可樂餅 Taiwan Night Market style. They are lovely crispy outside, soft and delicious inside. Korokke are originally a Japanese food but as Japan once owned Taiwan this food was adopted by the people as a favourite. 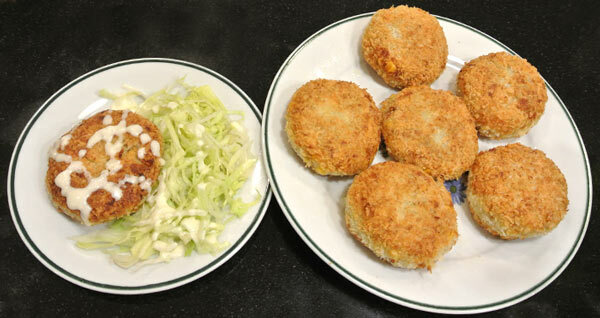 As well as Chicken and Mushroom flavour like Joanne makes in the video below, you can make seafood, beef or pork Korokke. Please watch the video above for the cooking method and techniques! Joanne guides you from forming the Korokke to frying and serving them. Remember you don’t have to strictly follow this recipe, other fillings blend with the mashed potato very well and you can also make different sizes and shapes as you wish. If you want to see and hear more Taiwan Teapot goings on please join us on Facebook. Here’s a delicious Taiwanese snack. It’s perfect for the summer months when you put your feet up with a beer to enjoy something on TV at night perhaps? 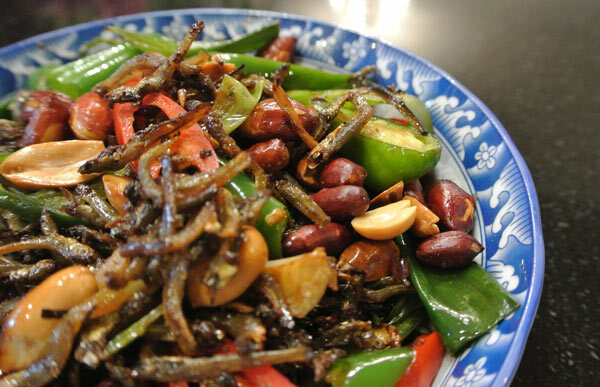 The two key ingredients are little dried fish and peanuts. The little fish provide plenty of calcium. As mentioned the key flavours of this snack come from the taste of the fried peanuts and the crispy little fish. However its more complex than that of course with the kick of the chilli and the piquancy of ginger and spring onion in there. A tiny bit of sugar and soy is used to bring the flavours forward. The method pretty simple. It’s best to watch Joanne’s short video below but briefly you fry the little fish until brown, take them off out of the pan and fry the ginger and spring onion whites. When they are ready add in the rest of the ingredients and reintroduce the little fish. 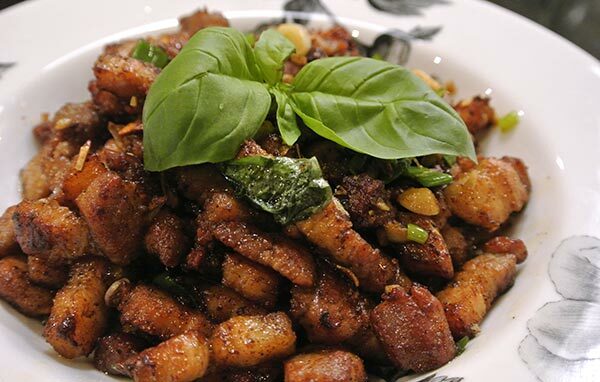 Here is a great snack for you – crispy pork 炸豬油粕ㄚ. We like to eat this either as a starter or with rice and some vegetables on the side it can make a perfectly good main course. I remember eating this as a child. My mum used to buy pig fat to make oil for cooking other things like stir fries. So lots of belly pork was cooked and the pieces weren’t required – but we liked to eat them as a treat! For the method have a look at the video below, it’s very simple. Most of your time will be spent in the chop[ping up of your pork! If you want to see and hear all the latest Taiwan Teapot news please join us on Facebook. Here’s an amazing picture from my uncle’s garden. I’m sure many of you have seen bananas growing before when you visit a tropical country – but normally you can see a few bunches perhaps numbered in the tens. 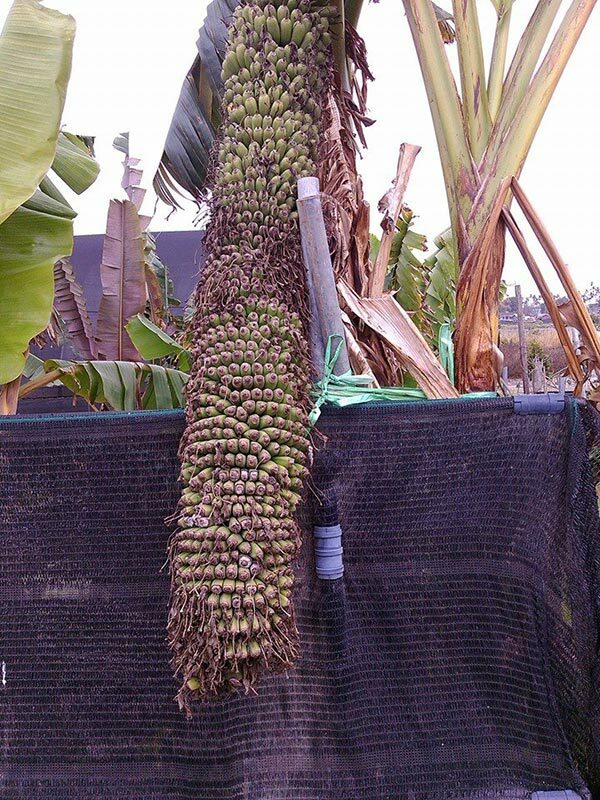 The photo above is from my uncle’s garden showing a banana palm tree he has which literally bears 1,000s of bananas. I’ve lived in Taiwan many years and been to other countries where they grow bananas like Cyprus and Madeira – however I’ve never seen anything like this! In the picture the lower bananas are quite short and stubby, but some people like them this way. I’ll ask my uncle to send me an updated picture when/if he has time and more bananas are ripe. Have you ever seen a banana palm tree like this? If you have any pictures of bigger bunches of bananas please link or share them below.